Document management - complete confidence with immediate availability Trusted document management services Crown’s management system for hard copy documents, files and cartons provides convenient access to information stored within your archive. Reckoned amongst one of the favored business organization, we are readily engrossed in presenting Document storage services to our patrons. A crew of dexterous employees has deep understanding in this area, which work round the clock and impart this service with brilliance within the certain span of time. After transfering documents to microfilm, we provide secure storage of all kinds of documents for our customers. We also provide a secure shredding service for customers requiring disposal of confidential or unnecessary information. We do Servive for is one of the Domestic Relocatios. It is a very active market and it is well known with customers across the India. There is usually no shortage of news to cause the movers and packers. 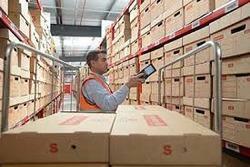 - Digitized documents can be stored on cloud. - We provide retrieval services from our website as well as the the mobile App. - Retrival can be restricted. MEGA DocuSafe is the latest venture of Mega Calibre Enterprises Pvt. Ltd.
Crownâ€™s management system for hard copy documents, files and cartons provides convenient access to information stored within your archive. Documents management empowers your organizational process by converting paper documents into digital / electronic formats. Stedinfo is the best place to outsource your documents management services, which helps to grow your business.